My last article was called Your 401(k): So Many Mutual Funds, Which to Choose There I described the selection of mutual funds from among the ones offered in your employer’s 401(k) or other pension plan. But mutual funds are sometimes not the only choices in a 401(k). Some plans offer other types of assets, which are not quite so easy to compare. 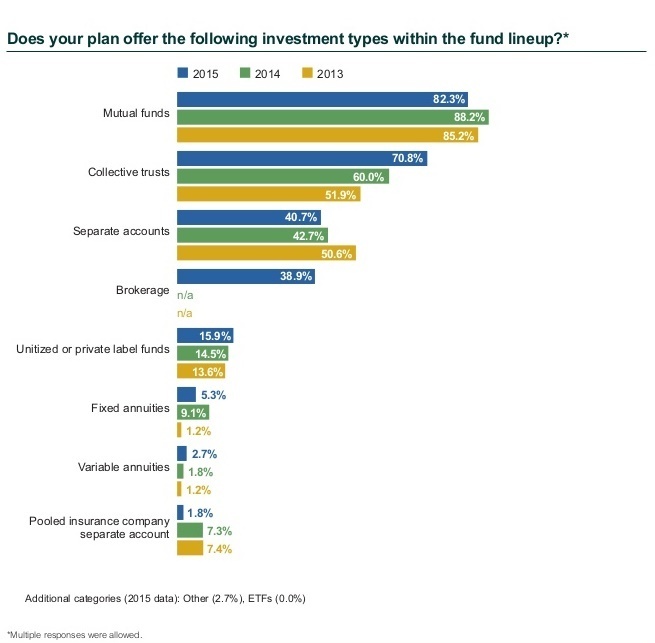 It’s clear that mutual funds are the category offered by the most pension plans (88% of plans offered them as of 2014). But the next big category is collective trusts. Collective trusts are for practical purposes similar to mutual funds, in that each represents a pool of capital invested in a basket of stocks or other securities. Collective trusts are also known as Collective investment trusts (CITs), commingled funds, collective investment funds or collective trust funds. I’ll refer to them all as CITs. You can often recognize them in your list of available investments by the word Trust or the abbreviation TR in the name, although not always. These are not new. In fact, the earliest ones were created in 1927, years before the Investment Company Act of 1940 which defined the “modern” mutual fund. The good news about them from the employee/investor’s point of view, is that the amount of fees that they extract from the fund is usually less than that of an equivalent standard mutual fund which contains the same assets (although often not as low as an Exchange-Traded Fund). Depending on what else is available to you, a CIT might be the best choice within your particular 401(k). The reason for the lower fees is that these vehicles are not covered under the same regulations as mutual funds, and they are not offered to retail investors. This means their regulatory and record-keeping costs are lower. CITs are not available directly to retail investors, but only through institutional structures including 401(k)s.
The not-so-good news about CITs is that it’s hard to get information about them. ETFs and standard mutual funds have tons of publicly available information. Yahoo Finance, Morningstar and other sources can tell you everything there is to know about mutual funds. There is no equivalent information available for CITs. Usually the only way to get any info on them is to login to your account on your plan administrator’s site. There you might find how the trust has performed compared with an index benchmark or category average. By looking it up on the administrator’s site, at least you can see what the category is that it’s being compared to. You can then indirectly compare it to other offerings in that category (say Large Cap Value funds or Small Cap Funds, etc. ), as described in my earlier article on which mutual fund to choose. In this way, you can make some evaluation of its suitability for you. If it happens to be the best performer among your stock fund choices, and it has been in existence long enough to have a track record that you can evaluate, then add it to your short list of candidates.